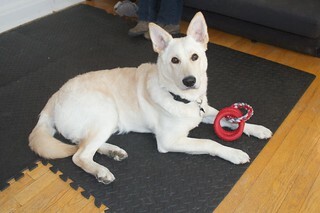 At eight months old, Balki weighs in at roughly 50 pounds. He is lean, muscular, and remarkably strong. We were lacking a tug-of-war toy that would hold up under the force that Balki can unleash. The Dogzilla Lockin’ Links toy by Petmate looked like just the kind of thing we needed. It was reasonably priced and it appeared to have the durability factor that we were looking for. It is a simple toy made of three rings, one of rope and the other two of rubber. The packaging makes quite a few claims that I can’t confirm, like "rubber infused with mouth-watering chicken flavor" and "rubber bumps help clean teeth and massage gums." Balki doesn’t seem to want to eat it and he prefers to grab the rope part instead of the rubber. Regardless, it has held up through quite a few matches which was all that we were hoping for. Bravo, Petmate!